Alex Jacob is a United Reformed Church Minister. He is currently serving as a Director of The Church's Ministry among Jewish People (CMJ). Alex has a well respected teaching and pastoral ministry. This book has emerged from many years of study, postgraduate research and personal engagement in the field of Jewish-Christian relations both in the UK and in Israel. What are the failings of Replacement Theology? What caused the schism between early Christianity and Rabbinical Judaism? What theological tools do we need to engage in Jewish-Christian relations? How should we interpret the terms 'Israel', 'the Church' and 'God's people'? How should we understand and apply Paul's teaching in Romans 9-11? How should we evaluate the contemporary emergence of the Jewish Messianic movement? How should the "Jewish roots" of Christianity translate into contemporary theological models? How and why should Christians share the gospel with Jewish people? 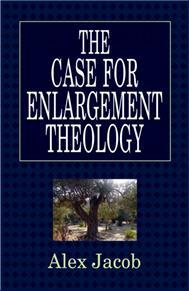 This book develops and explores the theme of Enlargement Theology and provides answers to these and many other key questions in the feld of Jewish-Christian relations and Biblical Studies. In this exciting study a new theological model is presented which breaks down the barriers resulting from both Replacement Theology (Supersessionism) and Two Covenant Theology. For all who are seeking to engage in a biblically faithful and astute way within the feld of Jewish-Christian relations. There is a book review available on the Prophecy Today UK web site. Buyers please note. This book is available at discount from CMJ. In addition CMJ is able to deal with trade / bulk enquiries. If you require in excess of one book, we recommend you check with CMJ via their website - or telephone them via their website. Find CMJ link and phone number in the LINKS section.